I was recently alerted to a Newsweek article on family squabbles around the legacy of Billy Graham. I have no particular comment on that, but it did remind me of how my denomination got on board the Billy Graham train. In 1962, in the MB Herald – the then-brand-new English language magazine of Canadian Mennonite Brethren – there were no less than three articles on the rising evangelical star and an appearance on the cover, as well as other “notes” throughout the year. I gather from this coverage that there must have been some questions about how MBs might respond to the Graham phenomenon; certainly public opinion about him varied. The emphases of these articles can probably tell us something about MB concerns and values of the time. Three matters seemed especially important: his finances, his humility, and his relationship to theological liberals. G.D. Huebert’s “Billy Graham: An evaluation” (Feb. 16) assured readers that charges of Graham being a multi-millionaire weren’t true; he made a “regular salary” of $ 15,000. 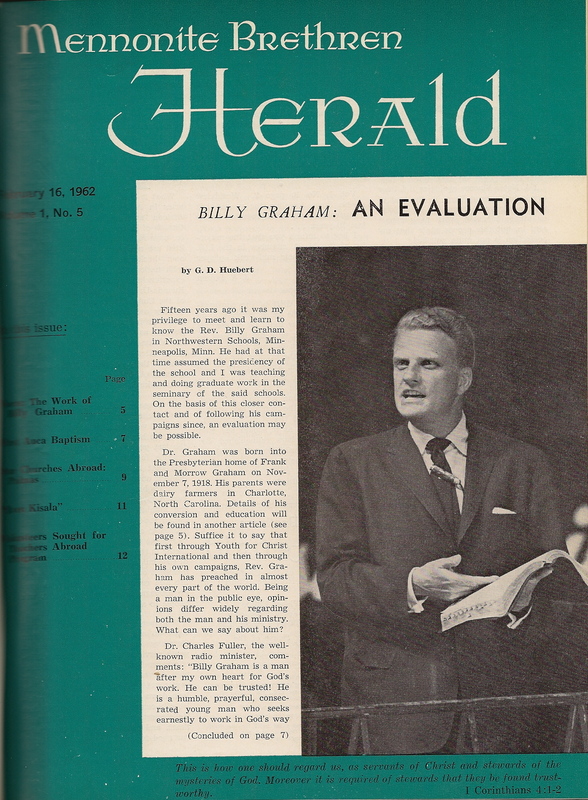 The Billy Graham Evangelistic Association was incorporated as a non-profit, Huebert continued, and its finances were audited. A second article in the same issue told something of Graham’s biography, including newspaper owner William Randolph Hearst’s order to “puff Graham.” Since then, the article went on, there is “probably no better known Christian in the world.” This second piece detailed the evangelist’s salary too, as well as the total receipts and expenses of the crusade in Philadelphia. This entry was posted in MB Herald, Mennnonite Brethren and tagged Billy Graham, G.D. Huebert, Leslie H. Stobbe, MB Herald, Mennonite Brethren and Billy Graham by doradueck. Bookmark the permalink. Dora: I happened across your blog — and this post — through its cross-posting at Mennonite Weekly Review. Great article! It’s title caught my attention, since I’ve been studying Anabaptist-evangelical interactions as part of my master’s thesis, Born-Again Brethren: The Brethren in Christ, the New Evangelicals, and the Cultural Transformation of a “Plain People”. I’m sure I could draw some similar conclusions about Brethren in Christ perspectives on Graham in the 1950s and 1960s. (Perhaps I’ll uncover something of the sort through my research.) In any case, it’s nice to make a connection with a fellow Anabaptist historian interested in the influence of evangelicalism. Shalom. Thanks, Devin. Your thesis sounds interesting. I agree, there’s probably a fair bit of similarity in the two denoms around this, though I don’t know as much about BIC as I’d like. The turn towards evangelicalism in the MB case seems almost implicit in their origins, with the various influences that shaped that beginning, and then in the 20s, identifying with fundamentalism. Best to you in your research and writing!